Place the onions, celery, and carrots in the bottom of your crock pot. Remove the skin from the thighs before placing them on top of the vegetables. In a medium bowl combine the tomato sauce, chipotles, the juice of the 3 limes, and cilantro before pouring the mixture over the thighs. Cook on low for 6 hours or high for 3 hours. 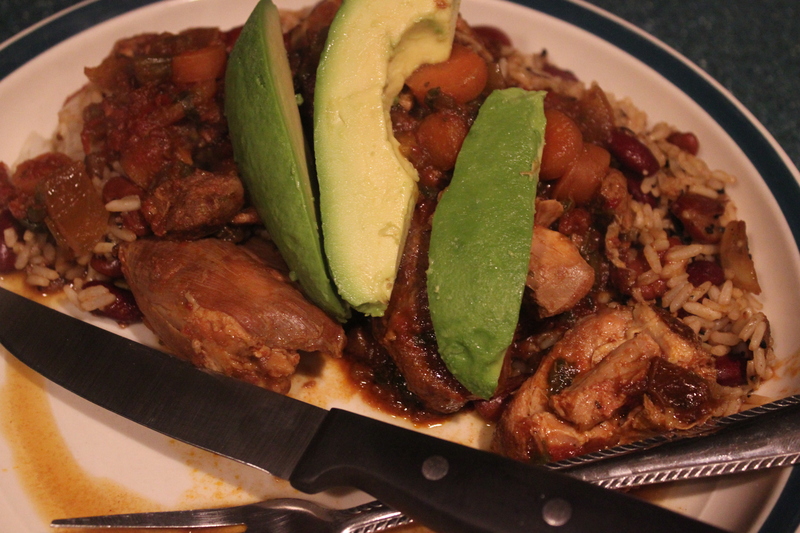 Remove the thighs and vegetables from the pot, arrange them on a serving platter, and top with diced avocados. Serve with red beans and rice. In a medium pot heat the oil over medium high heat before adding the onions to sauté for 3-4 minutes before adding the garlic. Sauté the onions and garlic for an additional 2 minutes before adding the beans and cilantro. Reduce the heat to medium low and simmer for 20-25 minutes. Serve over 2 cups of cooked white rice (pantry).